In the previous article, we have seen basics about the architecture of Oracle Dataguard. Oracle Data Guard works on physical standby and logical standby sites. Physical Standby: When primary database generates redo entries, those redo are transferred to standby database and then redo is applied to standby database. Logical Standby: When primary database generates any redo entries it is transferred to standby database and then redo data are converted into SQL statements and then those SQL statements are applied to standby database. 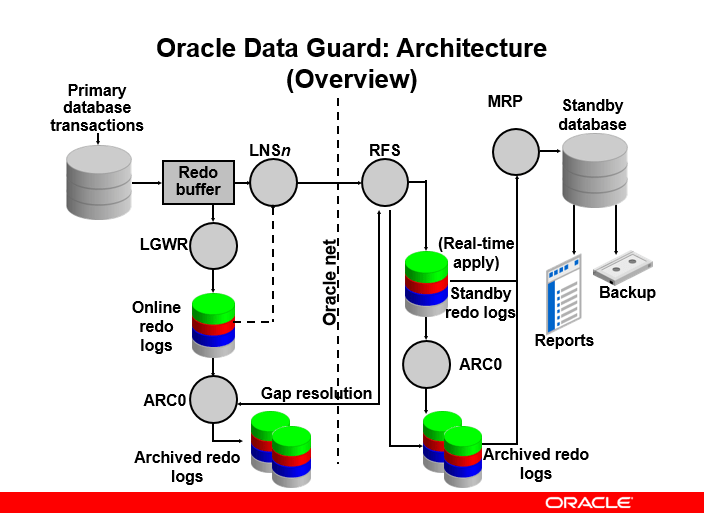 In this article, we are going to see Redo Apply Architecture of Oracle Dataguard. By default, apply services wait for the full archived redo log file to arrive on the standby database before applying it to the standby database. But we have the option to enable real-time apply. For that, we need to configure standby log files. which allows Data Guard to recover redo data from the current standby redo log file as it is being filled. In above diagram, we can see LNS process is responsible for transferring redo data from primary database’s Redo Buffer or Online redo log files to RFS process of the standby database. Then RFS process will write that redo to standby log files. Then MRP process will read that redo and directly apply redo data to Standby Database.